You are here:Home » Blog » Byron Bay Holiday Guide » Why Broken Head Camping Ground Should Be Your 1st Choice This Summer! It’s summer still, so make the most of it by taking a holiday to the Byron Bay area! Plan to stay at Broken Head Holiday Park where you’ll find plenty of options for your accommodation from non-powered campsites, to beach houses. So book now to find out why you and your family (or friends or partner) should be coming to Broken Head Holiday Park for your summer holiday every year. 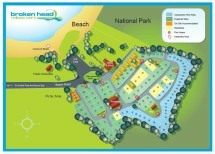 Broken Head Holiday Park provides two types of camp sites – un-powered or powered. Broken Head offers all guests large, well maintained sites to cater for all tent and caravan shapes and sizes. The powered sites may cost a little more, but the extra comfort makes it worthwhile. In addition, Broken Head campsites have direct beach access, meaning that a short walk lets you surf whenever you want. The beaches are clean, uncrowded and the surf is fantastic at this time of year. Byron Bay, with its range of activities and eateries, is just a short drive away from the campground. Beach Shacks – Perfect for a couple, two friends or whatever twosome you might have, the Beach Shacks offer one bathroom and one bed. They located super close to the beach and access to the Nature Reserve. For food, you can utilise the basic kitchenette with a microwave. Or, since it’s summer, why not head outside and use one of the BBQs to grill up some delicious meals? Beach House – For larger families or a big group of mates, look into our two-bedroom Beach House. It accommodates up to five people and features one bathroom. There is also a kitchenette, allowing you to make some of your meals easily (like a quick breakfast for the whole family before heading out on an adventure-filled day in Byron Bay). Our Camp Kitchen has two BBQs, fridge/freezer, hot water urn, sinks, microwave and toaster with plenty of seating. We also feature a smaller BBQ area with sink and seating area. You will also find here at Broken Head that we have separate disabled facilities as well as men’s and women’s showers and toilets. Laundry facilities with washers, dryers (coin operated), ironing board and iron are conveniently located onsite. The Kiosk alongside our Office/Reception area offers drinks, dairy, lollies and other food items you may have forgotten to pack. Activity and tour information is located in the reception/kiosk area, or check with our friendly reception team who will help you with any bookings you might like to make. Stay at Broken Head Holiday Park before summer ends! Broken Head Holiday Park offers first-rate budget accommodation in Byron Bay for whatever type of summer holiday you might envision from camping to cabin. Staying here provides the opportunity to be surrounded by the natural beauty of the area, but still within minutes of Byron Bay’s main drag. So keep us in mind when you plan your stop in the Byron Bay area!